Home » Electrics » Is This Electric Fence Legal and Compliant? Can you spot the electric fence violations in this picture? We spotted this electric fence installation recently and were shocked to think that a compliance certificate might have been issued. The alternative is that the owners or administrators of the wall used an unqualified electric fence installer, in which case there would be no compliance certificate. Either way, this electric fence is downright illegal! If you notice more faults than the ones we have pointed out, please list them in the comments below. We have numbered and listed the problems that we can see in this picture below. Note that the man walking in the picture is slightly built and not very tall. h. Spacing for warning signs on game and rural agricultural fences should not exceed 100 m.
a. The live wires must be at least 1,8 m above the level of natural ground at any point. b. Wall­-top brackets are to be installed at a maximum of 3,000 mm apart. c. The maximum distance between wires on the bracket must be 100 mm. d. The electric fence must be mounted on top of a wall that is at least 1.5 m high. e. A wall-top fence must be a minimum 1,500 mm above ground (ie at least 1.5 m). The distance from the public walkway is inadequate and there isn’t a barrier fence to protect the public using the walkway. 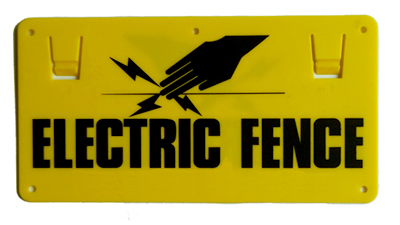 The general public should be protected by a barrier fence from making inadvertent contact with a free-standing (stand-alone) electric fence. 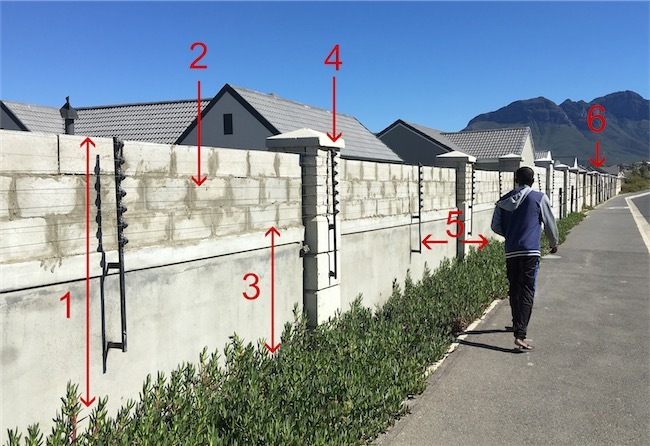 One can assume that the wall was built on the boundary line and it is clearly visible in the picture that the brackets and live wires stick out, away from the wall, into the public space. As you can see in the picture, further down the road there is no flower bed alongside the wall (see no. 6 in the picture). The brackets and electric fence live wires clearly extend over the walkway and even a child could easily make contact with these live wires. Where the flowerbed ends the live wires of the electric fence stick out dangerously into the pedestrian walkway. 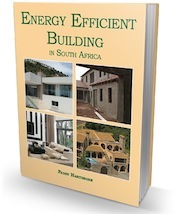 As required by the Act, the energizer must comply with SANS 60335­-2­-76 and the supplier of the product must be able to produce a certificate issued by an internationally recognised laboratory to verify this. i see wires and insulators … I know its an electric fence. i have a problem with the factt that the SAPS are to useless to pevent crime, I pay their costs with my tax dollar, but still need private, expensive security before I feel safe. Lets not forget the need to pay for education and medica, both of which should be pad for by our tax dollar!